AudioSalad’s powerful delivery/distribution engine makes transferring your content to third party services easy. No need to give up significant revenue share to under performing man in the middle’ distributors. 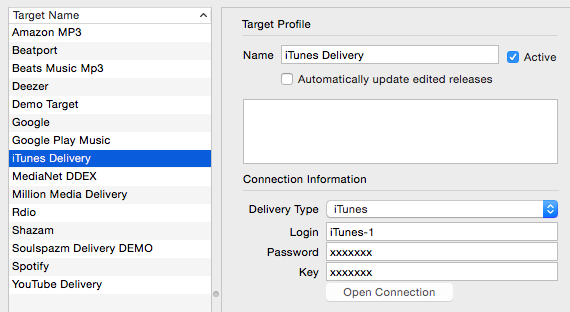 Deliveries can quickly be created using the drag and drop interface, or by delivering individual albums from within the release editor window. The target (iTunes, YouTube etc.) is selected and the batch is then ready for immediate delivery or ready for scheduled delivery at a later time. Audiosalad packages the media files and metadata XML set and transfers (FTP, Secure SFTP, Transporter) the content to third parties. AudioSalad tracks any changes that have been made to release metadata and can trigger updates and changes for content that has already been distributed. This statefull tracking of changes solves many headaches caused by errors with content handling and digital distribution. AudioSalad is an iTunes Certified Encoding partner and a trusted partner of YouTube (Content ID), Spotify, RDIO Amazon MP3, Beats Digital, Google Play Music, Deezer, Beatport, Spotify and many more. In addition, AudioSalad supports exports via the DDEX specification, as well as its own easy to work with XML schema for distributing content to many other entities. AudioSalad removes the headaches of understanding complex metadata structures, whilst keeping the delivery process transparent and simple to understand.